Then ... Caul has a sometime girlfriend, Amy, and occasionally he stops by unannounced to see her. Viewed through the gate from her apartment building's courtyard we see a Muni bus pull up mid-block across the street; Caul gets off and crosses towards us. and Now, this is Frederick Street between Masonic and Delmar in the Haight district. The 6-Parnassus bus still passes by the same spot stopping not here, but at the end of the block. Amy resides at the Casa Madrona Apartments at 110 - 116 Frederick Street in the Haight district near Buena Vista Park (map), pictured below in a recent photo. In another nod to its cinematic past Marilyn Monroe reportedly stayed here during a break from Hollywood. Then ... 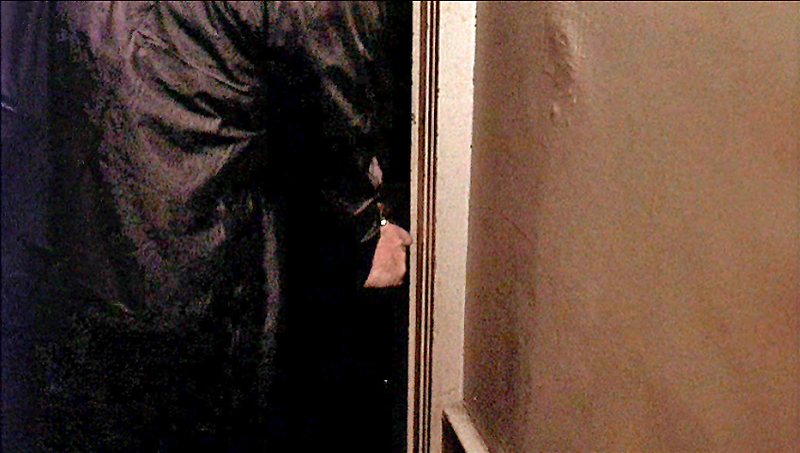 He enters the courtyard, closing the gate behind him. and Now, the masonry block front wall has been replaced or plastered over and extended into the courtyard to accomodate residents' mailboxes. 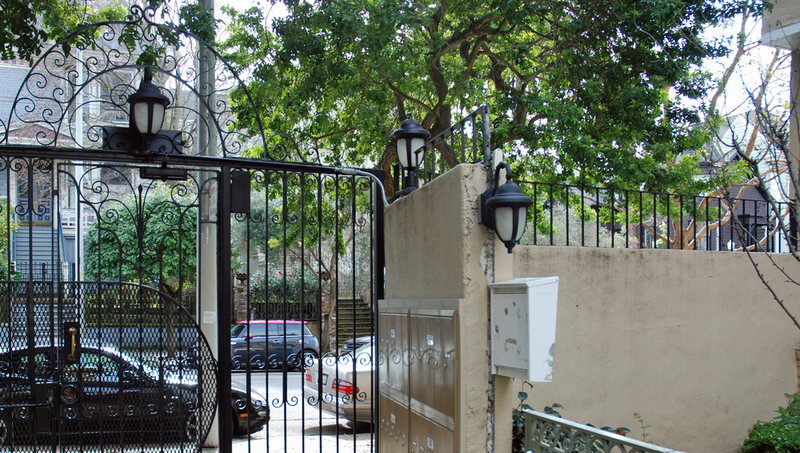 The wrought -iron gate has also been replaced - for added security it is taller than was its predecessor. Then ... He then makes his way past the ornamental fountain towards a lighted entrance ahead. and Now, the fountain has been replaced by another and a recently added railing now isolates it from the pathway. The masonry blocks built into the wall at rear, more clearly seen above, are still there, now peeking through shrubs. Then ... Inside the front door Caul pauses, lingering at the top of the steps, hanging back and peering down as though, paranoid, he wants to make sure nobody is watching. 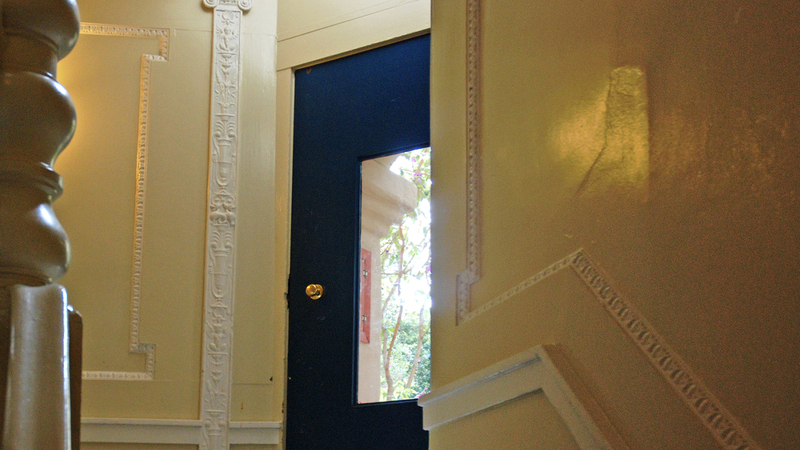 and Now, the hallway today shows all of the same architectural details. CitySleuth loves it when things stay just as they were! The door's window glass is different though, losing its style. Then ... Amy's apartment is at the bottom of the short flight of stairs. It's late and knowing she is probably in bed he lets himself in. and Now, that same door viewed from the top of the stairs. Then ... A skimpy wrap and plastic raincoat make strange bedfellows but Amy (Terri Garr) is warm and welcoming and happy to see him. They seem to get along fine as they snuggle up and share a bottle of wine. In the background we see a glimpse of the kitchen. ... and Now, the apartment actually has a separate bedroom but for the movie the bed was moved into the living room to make it appear to be a cosy studio. There have been a few changes since the early 70s including a remodeled kitchen but that's the same back door leading out from the apartment. Then ... Amy knows very little about Harry Caul - he keeps his personal life close to the vest. She wants to know more about him and it's clear that he is not at all comfortable with her questions. ... and Now, the door behind him is the door to the bedroom. Note the same wall moldings then and now. Then ... She keeps probing until, that's it ... he's had enough and abruptly leaves. On his way out she tells him she won't wait up for him any more. This man clearly has a hard time keeping friends. ... and Now, through the open door we see that the same newel post and bannister are still there.